Ruskin Mill Trust came into existence in 1984 and is now a national charity that provides inspiring education and care to young people who struggle to engage in learning in a mainstream provision. They will most often have autism, ADHD, attachment disorder, learning difficulties or mental health difficulties. They often will have a very complex background and difficult family situation and a history of failures to engage in any mainstream offer. Through an integrated curriculum, with a focus on practical skills, the method of the Trust enables young people to transform their own futures and realise their potential. 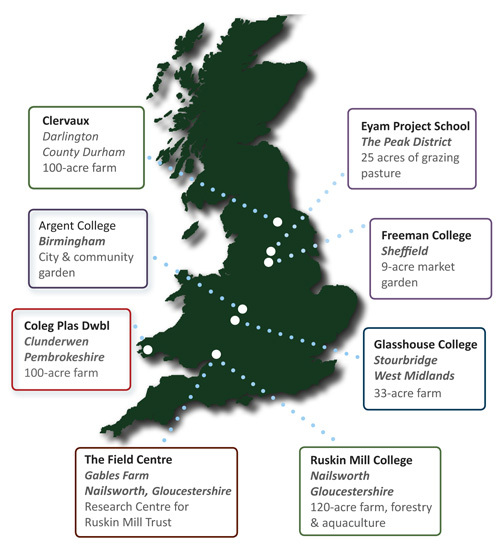 Currently, the Trust operates seven educational centres in the UK. The Trust adopts a unique pedagogic approach, Practical Skills Therapeutic Education, which reflects the insights of Rudolf Steiner, John Ruskin and William Morris. The vision of the Trust is to create new possibilities for young people by re-imagining their potential. This is achieved through providing students with holistic learning through positive role models, relationships, arts, crafts, commerce, agriculture, nutrition, living skills and the environment. Through this approach, students learn to look after themselves to the best of their ability, move closer to realising their capabilities and make a positive contribution to society. Practical Skills Therapeutic Education (PSTE) is the unique pedagogic method of the Trust. It stands behind the students’ curriculum and the professional development of our staff. Through its design, integrative nature and student-centred approach, PSTE provides vocational and work skills, as well as underpinning social and living skills through both the day and residential curriculum. PSTE is the curriculum method adopted throughout the Trust. Through this, students engage in practical activities, creating a holistic approach to learning through the integration of the head, the hand and the heart. In doing so, students develop cognitive and emotional capacities and develop a sense of will.